Hey! 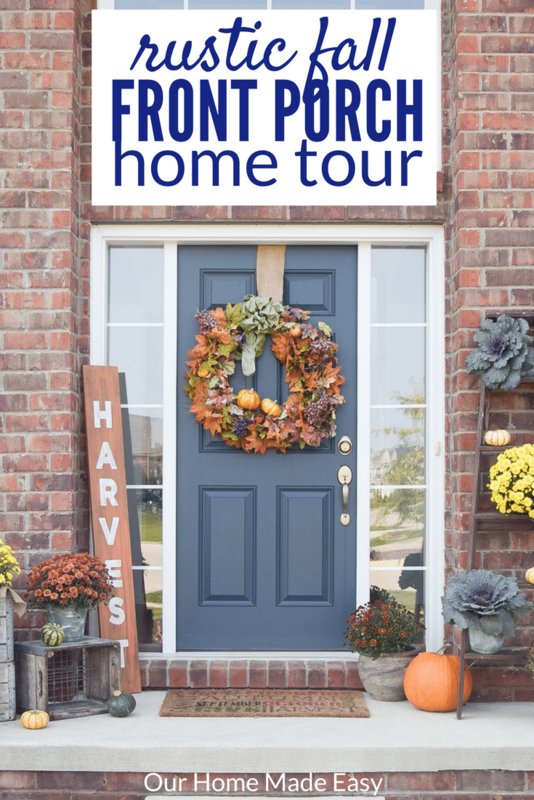 I am so happy that you’ve stopped by this morning so that I could share my love of front porch decorating with you. Can you believe the first day of fall is this Friday? 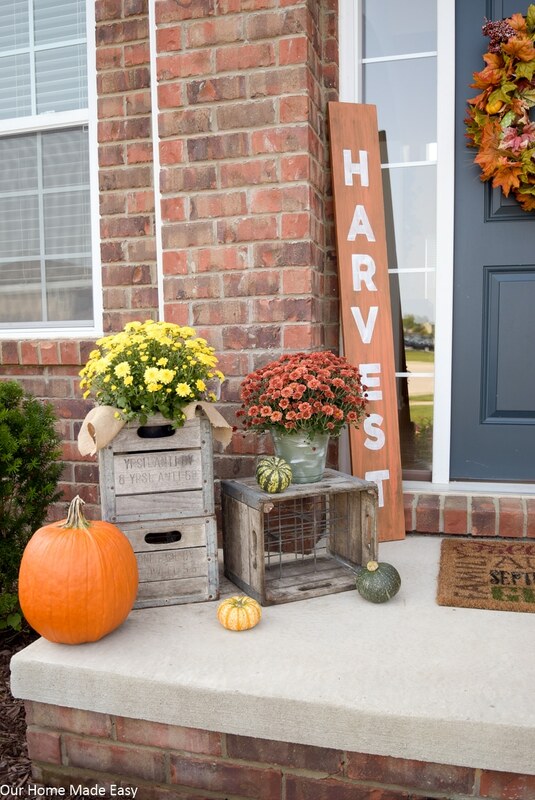 Let’s welcome it in with some fall inspired decor this week! I mean, Jordan doesn’t quite get it and well– the kids, they just want to know how soon they can water the flowers again. I suppose this might be the first year my mums don’t die to due to my neglect. Aubrey is already on top of it! 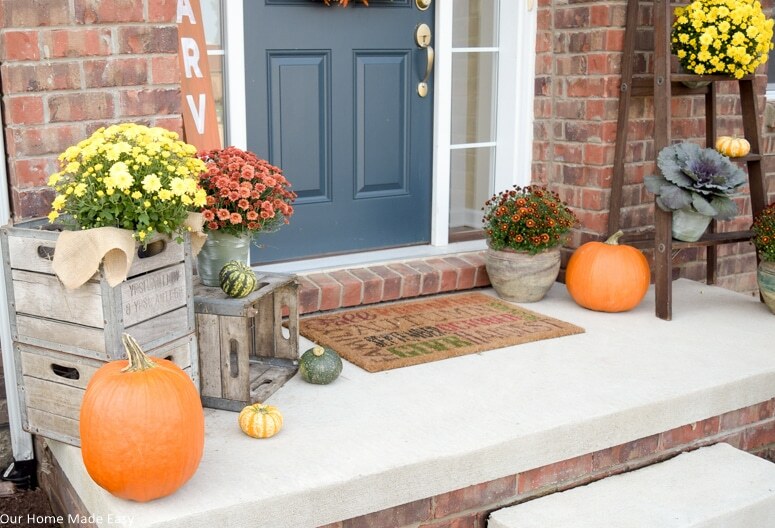 This year I wanted to change up our front porch a bit from last year’s fall front porch. But really– I didn’t want to spend too much money. Because with my not-so-green thumb, chances are that these beautiful flowers may not survive another month. 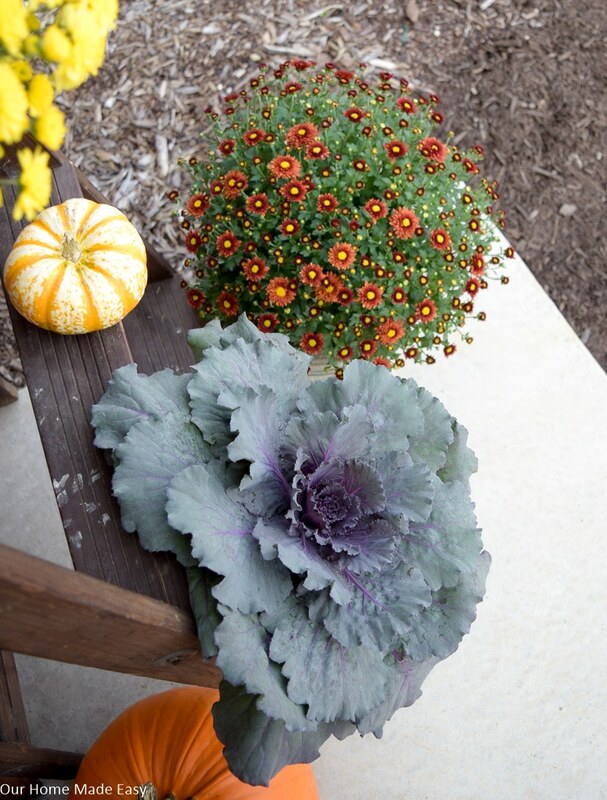 However– if they do, I am transplanting these mums and kale into our flowerbeds! 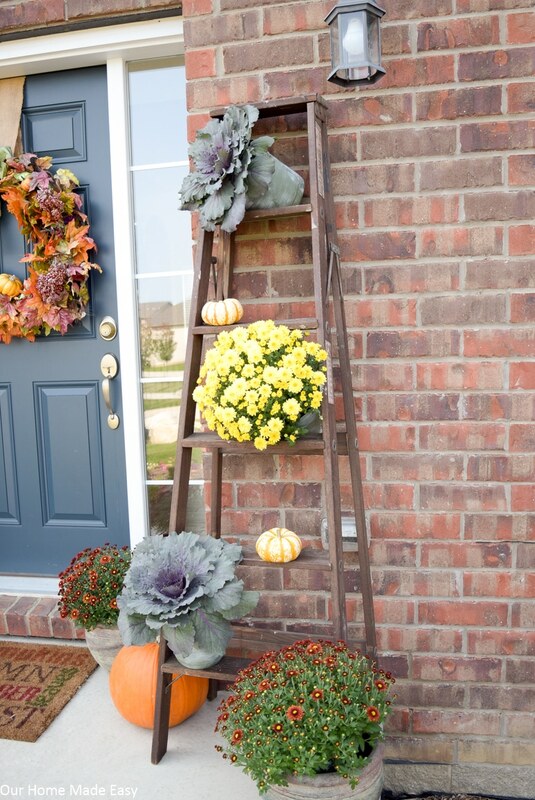 Now you might be wondering– how on earth will I have time to decorate my own fall front porch? I know how you feel. 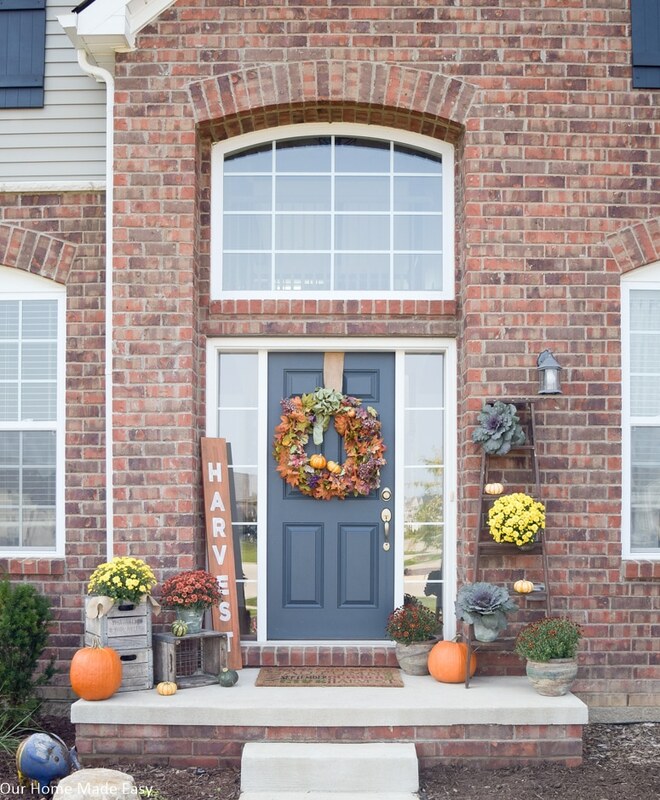 I wrote a blog post last fall about how to decorate your front porch in 5 easy steps. Definitely check it out. For this year, I planned a few days in advance of what I wanted to build and use. I don’t have much spare time in the evenings and I like to use as much time as possible rather than experimenting. So when nap-time happened on Saturday, I used that as my opportunity to start organizing my thoughts into something like this…. Doesn’t it look spiffy for fall time? But I have to tell you— it was really warm this past weekend in Michigan and I was burning a sweat under the sun. It just didn’t seem quite right. But don’t worry, I’d happily take the sunshine and heat over cloudy and 60 degrees any day! Since I was avoiding spending too much money, I want to keep some decor I already had. The milk crates are oldies but goodies. I have been loving using them for several seasons now. They were passed down by an old co-worker from a dairy farm in the area. 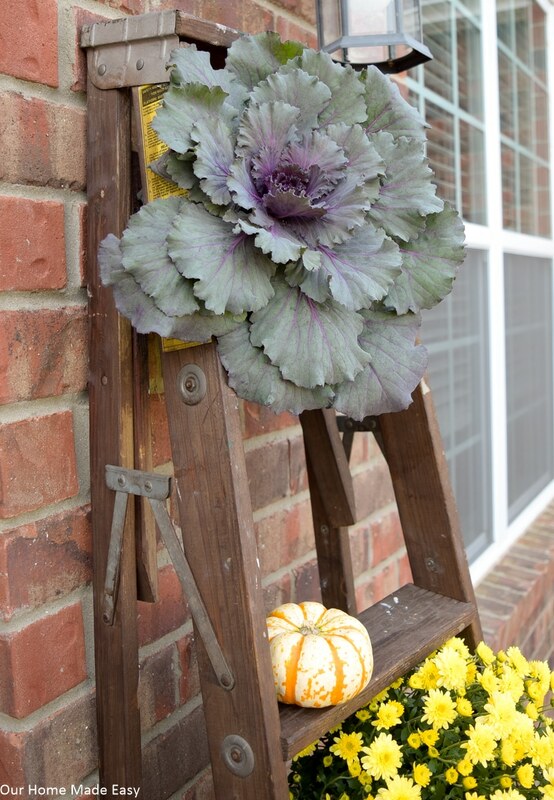 While they are antiques, they are in awesome shape and always look great on our front porch. You might remember the big sign from last year. 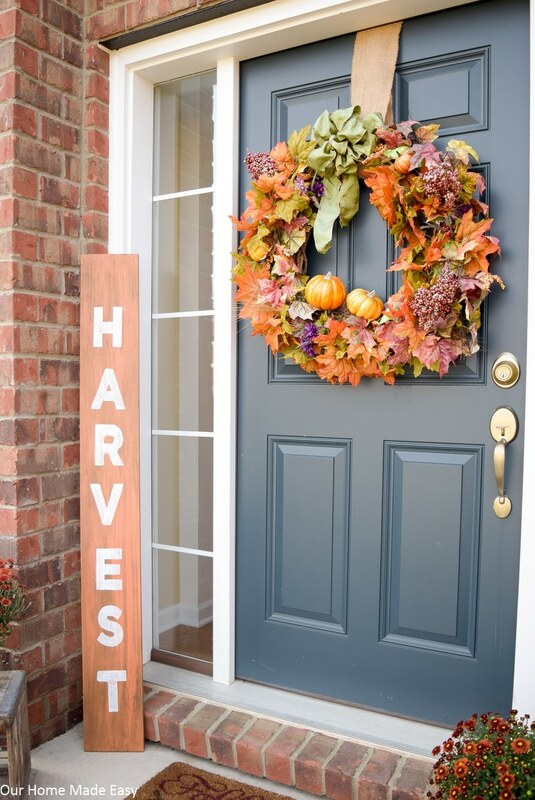 The orange ‘HARVEST’ sign is an easy DIY project we made last fall (You can see the fall DIY sign tutorial here). I paid less than $4 a piece for the mums and pumpkins. The trio of small pumpkins were less than a dollar apiece at Wal-Mart. 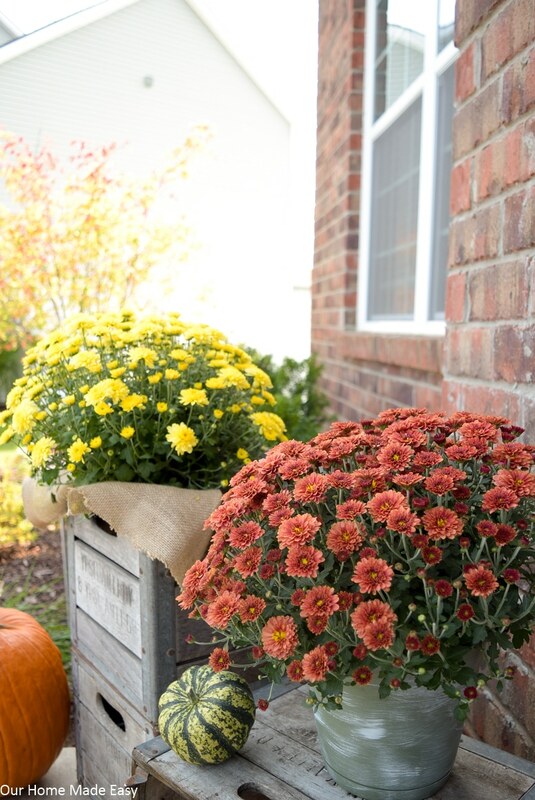 I used some burlap fabric from Jo-Ann Fabrics to add some softness around the mums. At $3.99 a yard and with a 60% off coupon, it was just a few cents to add this bit of charm. For the green planters around the mums, I picked those up for about $3 apiece. Can you believe they used to look like this?? I’ll share what I did to add some character next week! It was ridiculously easy. Last year I picked up a few straw bales on the left side of the front porch. This year, I swapped the ‘HARVEST’ sign to the left side and then went on a hunt for something to add some height on the right side. On Friday night I searched online for a wood ladder, set my search perimeter to a handful of miles. And voila! This wooden ladder showed up in my search results for TEN DOLLARS. 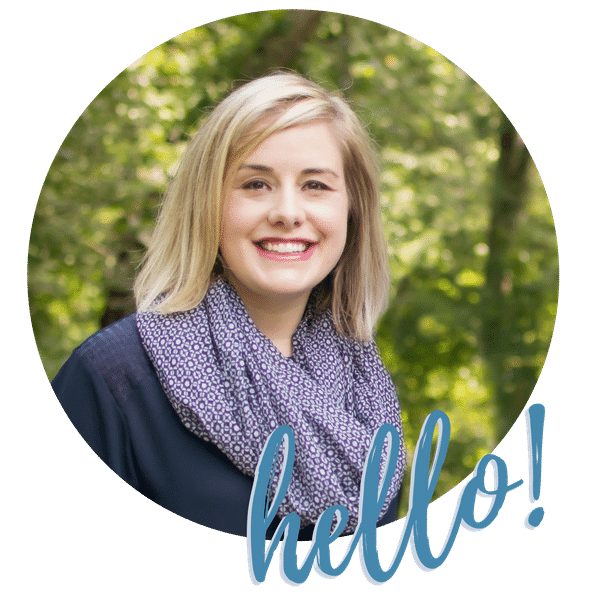 I was so excited to add something new– and without feeling guilty about spending money. I am already considering how I can include in for Christmas decor. If you think of something, send it my way. Let’s check in again in a month and see how these mums are faring. Aubrey & Owen love watering the plants, so hopefully I’ll have good news to share. Last fall I suspected it would be the last year for this wreath. But alas, why throw away what isn’t broken? After 6+ years, it’s still going strong. It’s moved from the Gulf Coast of Alabama up to Michigan 4 years ago. It’s a tough cookie. If I had thought more about it, I would’ve picked up a new bow, but I ran out of time. I used a new piece of burlap ribbon to cover the plastic wreath hanger. The little green gourds are from our neighbor’s garden. They gifted us a handful of zucchini and yellow squash last week. Included in their gift were a few little gourds that are perfect for adding to the porch. I might even use more inside—- but I’m not that far into decorating yet. I’ll be back the rest of this week to share more rooms that are already decorated for fall! 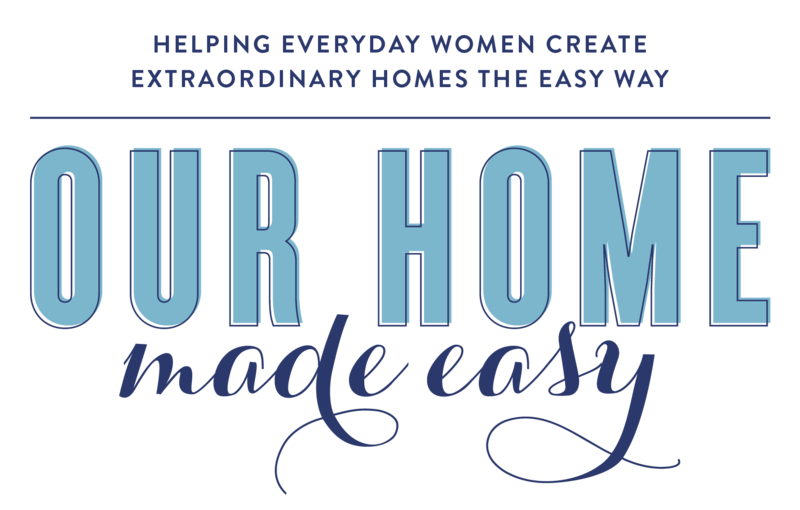 Not only is it our 5 year weeding anniversary this week (I have a post about it coming soon), I’ll be sharing our family room decorated along with several other home decor bloggers. 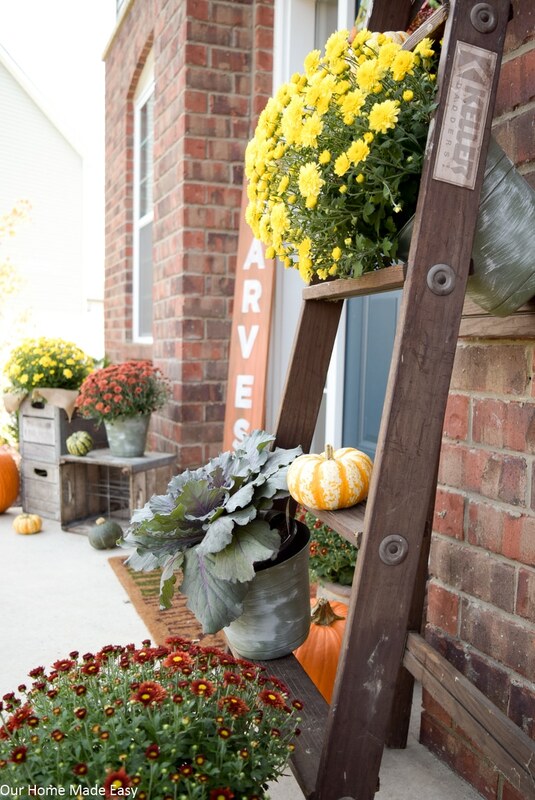 Have you started decorating your front porch? What do you always include? Tell me in the comments! It looks so beautiful!! I love that you used kale too — and that your husband was totally confused by it.? I may have to grab a few kale plants next time I’m at the store. Great job with your porch!